Car-Free Sunday SG 2018 | JustRunLah! Mark your calendars for 29 April so you won’t miss our exciting line-up of activities! Some highlights include a drone showcase, mountain biking trials, one-north Discovery Walk and robotics jamming for kids. 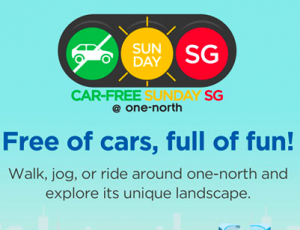 This is the first time that JTC and the Urban Redevelopment Authority will be collaborating to bring Car-Free Sunday SG out of the Civic District. It’s also part of our push towards active mobility to achieve a car-lite environment for the one-north estate.